Have you ever wondered if a career in cricket is a viable option? Cricket or any sports needs tremendous dedication and focus. It’s not something that happens by fluke. I caught up with Snehal Pradhan, a former Indian cricketer to understand what it means to have a career in Cricket. I was born and bought up in Pune and did my BSc in Microbiology from Abasaheb Garware College. In my third year, I was selected by Western Railways through sports quota and I started playing for Western Railways cricket team. I worked in Mumbai for 9-10 years where we worked for half the day and the rest of the day was when we practiced cricket. We also got official leaves for tournaments. I had good facilities and good players, which kept me in the game, otherwise after BSc, I was thinking of doing my MSc as I had to think about a career. This opportunity helped me to continue my game while earning some money. In 2015 I decided, I had to move on to the next phase of my career. I had been writing a blog, side-by-side with my cricketing career, but then I realized I was liking it and decided to put a bit more effort. An editor saw my blog and approached me to write for their website which I did intermittently, so when I quit international cricket, I took to writing full time. 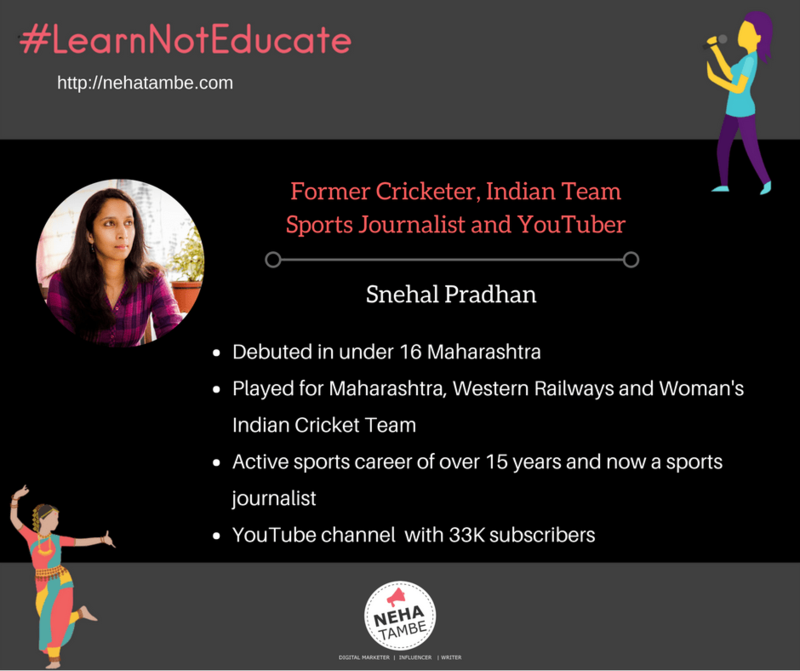 Since then I have been a freelance sports journalist and in the past 6-9 months, I have also started my YouTube Channel – ‘Cricket with Snehal in Hindi and English’ where I am doing cricket tutorials. For how many years have you been playing cricket? I made my debut in under 16 and under 19 Maharashtra. In 2005, I was part of under 21 India tour to Pakistan and In 2008, I made my debut for India at the age 21. I played International cricket and represented India for about 3 years, spread over 10 games. The last international game was in 2011. I continued playing domestic cricket and represented Maharashtra for around 15 years, from 2000-2015. When was the first time you played cricket? I don’t really remember. My parents tell me that as a kid, I would just pick-up whatever was around and imitate the cricket shots that were being telecast on TV. I always played with the neighborhood boys and boys in school. That’s how I started playing cricket. When I was in 8th std, my family introduced me to Shubhangi Kulkarni who was a former India captain, and she introduced me to the Indian cricket team, and that’s how my cricketing journey started. How did you decide to take it up as a profession? I always wanted to take cricket as a profession. Earlier cricket was under Woman’s Cricket Association and it wasn’t feasible to take it up as a full time profession. Cricket is now under BCCI. BCCI took over only in 2006 and my journey started in around 2000. We weren’t earning anything back then but then the Western Railways opportunity came up and that is why I could continue playing cricket semi-professionally, where I worked half-day and the rest of the day was for practice. Was there any resistance at home or from the society? Thankfully there was no resistance from home and I come from a very open minded family. Both my grandparents were well-educated and open-minded and they always encouraged me in my choices. From society – There was this one percent people who would come up with resistance in small things like, when I was in 7th std and was training at a club in Pune, they never had a girl there and they didn’t want to show that there was a girl, so they asked me to tuck my ponytail in my hat, so that it isn’t obvious! Then once when I was working in Mumbai and playing a club level match, I was the only girl in the team and the opposition refused to play with us, citing a reason that they won’t play with a girl. My coaches, the boys with whom I have played were always very supportive.I have a theory that those who have support, only they make it to the ground. What does it take to be a cricketer? Taking up cricket as a profession is not easy. It means a lot of sacrifices. Right from highschool, summer vacations meant a lot of training and practice, so no vacations as such. The trainings are hectic as you need to get up early in the morning. My parents too were supportive and have put in a lot of effort. My dad dropped me off and picked me up from the training center, at times I used to cycle for around 10 km to reach my training center. Working and training meant getting up early and directly going to the ground for training, catch some lunch enroute and then go to work. The daily schedule was from morning 6am to evening7pm. It was difficult to manage. Now most of the Indian cricketers have full time contract, so they can afford to not work, but it wasn’t so earlier. Monsoon is the only time when there are no tournaments, so life is scheduled around cricket season. Can girls think about taking cricket up as a career? Now it is much more attractive to take up as a profession. When I was playing, we were under the Women’s Cricket Association, pre BCCI days. We were not paid for playing state level and there were not many facilities in terms of travel and stay. Now, it’s under BCCI, so girls who start get BCCI facilities, they travel by air, get paid for playing state level. If you are selected for the Indian Cricket Team you get paid well. So things are much better and lucrative to make cricket a serious career option. One down-side is that there aren’t many government organizations that offer jobs in Woman’s Cricket. It’s only the Indian Railways that offers you a job, which you can keep even after you stop playing cricket. Any tips for those looking at taking up cricket or any sport as a profession? – Give it everything. Cricket is not a sport that you can excel in with half-hearted efforts. It’s not something that can be done while managing other things. Be completely focused on your game. – Right from your training days, treat it like a professional athlete would treat it. What are the career options available after retirement? BCCI is coming up with more women focused courses that a cricketer can take. For eg: you can do courses for being a coach or a strength and training coach. Any advice to the parents of youngsters who are keen on taking up sports as a career? This is a sport where parents will have to be supportive and involved in their child’s progress. Right from dropping children to their training, to funding their equipment, right food, right sleep habits, everything needs to be provided for and monitored. Parents should however take a backseat on the field. Select a good coach and let the coach take the decisions. Sometimes the parents are too involved and that hampers the child’s growth on the field and off the field as well. This is an interview in the series of #LearnNotEducate. This is a way to highlight satisfying alternative careers and busting myths related to traditional courses. If you follow an alternate course, and wish to be featured on my blog, fill in this Google Form and I will get in touch with you. Snehal is an inspiring youtube coach. The kind of research she puts on her videos shows her passion to the sport. And ofcourse her clincher is that kids will make it to the ground only with support. Thank you so much for this series Neha. Cricket is such popular game in India however, the irony is Indian women cricket team still isn’t that popular. Post these like will motivate many young girls to choose better career options following their passion. What a wonderful read! She is an inspiration. Loved her advice that parents should encourage at every step, yet on the field should take a back seat and let the child come of his own. Snehal is definitely an inspiration to all the budding women cricketers. Parent’s support and encouragement is very important. Thanks Neha for your efforts in doing this series. Love this article. I am all for women considering sports as a career especially in a male dominant sport such as cricket. Great read. This one is amazing!! Never read such a thorough interview of a woman cricketer. Thoroughly enjoyed it. Thanks for sharing. A very informative article for me. My husband has a high inclination towards the game and it’s good to know if we go ahead for our kid how to go about it. Cricket is India’s favourite game.Its a big challenge to take up sports as a profession.Loved reading about wonderful ays to earn a living with passion! Thanks for sharing Shenal’s journey. She is a huge inspiration. My daughter is into competitive sports an d I shall tell her about Snehal’s journey, she can take up motivation from her. It is good to know that Cricket has so many career options for women too. Also, after the retirement they are opportunities to keep working. I never knew about the scope for girls in cricket! I’m definitely going to checkout the YouTube channel as well! I am so happy to.read this as my thinking is not to push the kids but support them in whatever they want to do. Good to know about Snehal and her journey. She has made her mark. Her journey is inspiring and her tips for the newcomers are great. To achieve we have to give our heart and soul. I think all sports in India are catching up and getting the respect and recognition. Great post. 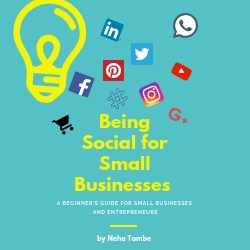 This is such an inspirational series you are doing Neha. And bringing out this interview with Snehal Pradhan will clear so many doubts kids and parents have about the sport. This interview is really inspiring.. And will help upcoming cricketers. Cricket being a religion in india…womens cricket team was never popular…thats the reason why lots of women never choose this as a profession. This interview is so inspiring.